During the French Revolution (1789–1799) a new generation risked their lives to make the ideals of the Enlightenment a reality. They overthrew the Monarchy, established the first modern Republic, and proclaimed the universal rights of man. In the short run, their Revolution was a bloody failure. In the long run, it swept everything before it. On the eve of the Revolution, France was in a state of deepening crisis. Louis XV (r. 1715–1774) had been an uninspiring, lecherous, do-nothing king. Sensing the revolutionary danger in the Enlightenment, he is supposed to have said “after me, the deluge.” His grandson, Louis XVI, was kindly, fat, and simple, while his wife, Marie Antoinette, was a young and beautiful Austrian princess who spent fantastic sums of money on parties and jewelry. France had gone deeply into debt to finance America’s bid for independence, and, though it had the satisfaction of avenging itself for earlier defeats at the hands of Great Britain, the American Revolution proved one burden too many for its antiquated financial system. Also, as Louis’s advisers had vainly warned him, the success of the American Revolution encouraged similar hopes in France. Tax collectors were corrupt and inefficient, and the people knew that much of their money was being wasted. By ancient custom, the aristocracy and the church paid nothing. A series of bad harvests forced the government into bankruptcy in 1789, and Louis called for a meeting of the ancient legislature of France—the Estates General—to deal with the crisis. Although as an absolute monarch he had legal authority to do more or less as he pleased, he hoped that the convocation of the Estates would show that his government was serious about reform, and that the Estates in turn would approve extraordinary measures that might otherwise meet with resistance. In other words, he was looking for legitimacy to shore up his government. The whole nation was consulted as to what kind of reforms they wanted to see, and these petitions (the Cahiers—notebooks) became the basis of reform. They also elected delegates to represent them. Expectations ran very high indeed when the Estates first met. However, the Estates quickly broke down in factional squabbling. The leaders of the aristocracy and the clergy, who were principally interested in using it to enhance their own power at the hands of the monarchy, marched out in a huff when they realized they could not control it, as they had in the past. The lower orders of both joined the representatives of the common people in declaring themselves the National Assembly—the true government of France. Finding themselves locked out of the assembly hall one day (it turns out, by accident), they declared they would never submit to tyranny and swore to continue meeting until France had a constitution. Meanwhile, popular excitement was getting out of control. In July, a crowd of Parisians stormed the Bastille, famous as a political prison and symbol of the arbitrary power of the Bourbon monarchy. When the commandant of the prison surrendered, the crowd massacred the garrison, cut the commandant's head off, stuck it on a pike, and paraded up and down the streets with it. A few months later another crowd descended on the royal palace at Versailles, abducted the king, and brought him back to Paris, where he could be watched more closely. In the countryside peasants broke into the manor houses, took what they wanted, burned tax and property records and occasionally killed their lords. As the feudal order began to collapse the aristocrats fled to Austria, where they agitated for an invasion. The Holy Roman Emperor Leopold II, also Marie Antoinette’s brother, looked on the turmoil with increasing alarm. In September 1791, the Assembly abolished feudal and ecclesiastical privileges, declared limited manhood suffrage, conferred the right to trial by jury, and gave France a constitutional monarchy. Careers would be open to talent. In June, the king and his family, fearing for their lives, fled the capital. They were recognized near the Austrian border, sent back to Paris, and for all intents and purposes kept under house arrest from that time on. In April 1792 Austria declared war, and its general, in a document called the Brunswick manifesto, threatened the Parisians with bloody retribution if they mistreated the royal family. They responded by abolishing the monarchy (August 1792). A year later Louis was executed, and eventually Marie Antoinette as well. Their son, Louis XVII in royalist memory, died in a Paris prison in 1795. He was ten years old. Meanwhile, the small but professional Austrian army was overwhelmed at Valmy by a new sight on the European battlefield—a huge army of poorly trained, poorly equipped, but fanatically determined citizen-soldiers. For the next decade, these armies consistently trounced their royalist opponents and filled the treasuries of France with the plunder of foreign conquest. Under the pressure of war and a continual climate of fear and uncertainty, politics within the Assembly grew increasingly radical. When the king was executed, conservatives who had defended the King (the Gironde) feared for their lives and quit the assembly, leaving their sometimes allies, the moderates (Cordeliers), to face the extremist Jacobins (the Montagne) alone. Huge crowds of working-class spectators (Sans-culottes) waited outside the assembly and listened to every word. Popular newspapers hinted darkly of conspiracies against the people, and from time to time the Sans-culottes burst into the assembly and threatened the legislators with violence. The Jacobins, both fearing and wanting to harness their power, created a new constitution (June 1793). It made work and basic necessities human rights, and gave the vote to all men of military age. Dissension had become dangerous, and not a few legislators were arrested and executed for untimely opposition. In March 1793, a “committee of public safety” was formed. Its leader, Robespierre, was a populist dictator in all but name. Outside Paris, opposition to the Revolution was growing. Uprisings in the Vendee and Lyon (Western and Southern France) were bloodily suppressed, and commissars were sent out with arbitrary and unlimited powers. Secret police spread throughout the country, and informers used them to settle old grudges and personal disputes. A hush descended over the country, as even a hint of opposition could lead to arrest and execution. As many as forty thousand people were guillotined. The Jacobins abolished the old (Catholic) calendar and unveiled a new religion—the Cult of the Supreme Being. Churches were turned into Temples of Reason, Saints were replaced by Martyrs of the Revolution, and effigies of the Goddess of Reason were paraded through the streets. The official state religion was briefly a form of humanist atheism, which borrowed and transformed as much as it could from the Church it was replacing. Christianity was outlawed. By July 1794, Paris had had enough of the Jacobins. Robespierre lost a key vote, and, sensing weakness, the assembly shouted him down and removed him from the podium. The Jacobin party was outlawed, Robespierre and his leading accomplices were arrested and swiftly executed—the terror was over. For five years, a new government, called the Directory, muddled along. Although it was not particularly violent, it was faction-ridden, corrupt, ineffectual, and unpopular. Its political police suppressed extremists on the right and left. In 1799, Sieyes, one of the leaders of the directory and a veteran of the revolution, decided to abolish the Directory and set himself up as dictator. To do this he called on the help of a brilliant young general, fresh from conquest (and debacle) in Egypt—Napoleon Bonaparte. Bonaparte swiftly replaced Sieyes as dictator in all but name, at which point the First Republic became the First Empire. The Revolution was over. 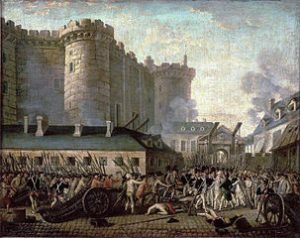 The French Revolution is important in intellectual history because it demonstrated the power of modern institutions and ideals, and because responses to it have defined much political philosophy ever since. The Enlightenment did not spread through mere force of argument—it was carried to every corner of Europe by the victorious French armies, as it was to every corner of the world by the British. In the aftermath of the Napoleonic wars, the power of Enlightenment ideals was no longer open to dispute. Although France was eventually defeated, for twenty-five years it had dominated every other power on the continent. For the next two centuries, modernization meant power, and that power could only be secured by embracing the ideals of the Enlightenment. However, the dangers of modernization were also immediately apparent. The old world had known nothing of democracy or the rights of man, it was true—but it hadn't known anything about state terror either. For the next century, the promise of the Enlightenment was inextricably caught up with the ideals, the power, and the terror of the French Revolution. This post in the sixth in a series on the philosophy of history; the previous article in the series is here, the next is here.